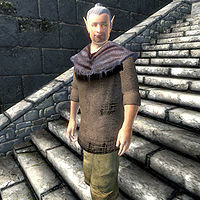 Uungor is a Bosmer commoner living on the streets in Bliss, New Sheoth. Uungor claims to be sane, but in a sad irony, he is completely obsessed with proving his sanity as well as his escape from the Isles. During the quest Falling Awake Uungor's bedroll under the stars will prove useful to the overly paranoid Amiable Fanriene. 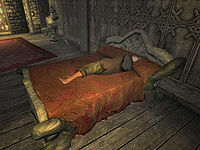 Before you encounter Fanriene, Uungor lives the standard life of a beggar; he will sleep from midnight to 8am in his bedroll above the streets, between The Choosy Beggar and the Palace entrance. Uungor will pray at the Sacellum Arden-Sul for two hours after waking up. He will eat lunch for an hour near his bedroll at midday, and will have a two hour dinner starting at 5pm in the same place. At 8pm he will wander near his bedroll for four hours before he goes to sleep. In his free time Uungor explores Bliss, staying near the fountain. He wears the rare beggar's shirt and a pair of sack cloth pants. He also has a tan cup and a piece of food. Uungor has contracted the disease Ataxia. When you approach him, the paranoid beggar will ask: "I'm not like them. Are you? Are you one of them?" If you talk to him, it becomes clear that he desperately tries to convince himself to be 'normal', in the process going insane: "I don't belong here. I'm not crazy. Not like the rest of them. They watch me, you know. Waiting for me to go crazy. But I won't. Nope." After the conversation he will assure you: "I'm leaving. I've got to find a way out of here." If you meet him after finishing the Main Quest his greetings will be more humble, but equally insane: "Only you can eat the fruit of madness. ", "Someday I hope you will invite me to eat with you in the palace, Lord Sheogorath." and "My belly is rumbling, so I must leave. It has been an honor to talk to you, Lord Sheogorath." During the Falling Awake quest, you must help out overly paranoid Amiable Fanriene find a safe place to sleep. Most obvious choice is to talk to the many homeless people in New Sheoth, including Uungor, who happens to have a bedroll out in the open. Asking the other homeless individuals will net you information pointing to Uungor. In Crucible, Gloorolros will stop talking about sticks for a while and instead show a huge amount of hatred towards Uungor: "Oh, here's a notion for ya. Uungor really gets on us nerves. You could kill -- or, persuade -- hisself to leave. Run him through -- or, run him out, I mean. Yeah, get rid of him. Then, your friend can sleep outside in Uungor's bed." Bolwing, on the other hand, will say: "Friend no dorpidity? Communce to Uungor. Uungor communces he no deliriotic, that he mented fine. But Uungor is very deliriotic. Oversit me? Uungor communces he "bye-bye." Communce with Uungor. Are you identing me? Communce with Uungor! Give friend dorpidity in Uungor's dormitiloo." If you happen to be Sheogorath or have Big Head's Charm in your possession, he will be a lot easier to understand: "Anything I can do to help you. Really, you should speak with Uungor. He doesn't want to be here, anyway. Poor fellow believes himself sane! I'm sure it will be sufficient. Poor, poor Uungor. So misunderstood. And, I know what that's like." The dog-loving Bhisha will add: "Go talk to Uungor. He's always talking about leaving, anyway. Your friend can sleep where Uungor does now." Talking to Uungor will reveal how suspicious he is: "It's just one more way they try to get me to get all "special" in the head. Right? Make me sleep outside and everything. I don't belong here, really. What I would do for a warm bed. Soon I'll be leaving here. As soon as I can figure out how to leave without them noticing." When asked about switching beds he will say: "Why would he want to sleep in a bedroll and give me his bed? Sounds queer. I bet it's just another trick to get my head all twisted around. Trade places, a bed under a roof for a bedroll under the stars? Mm-hmm. Sure, sure. I don't trust you." Unexpected help is present in Bliss, however; food-crazy Fimmion will demand a sweetroll in exchange for the grapes he once stole from Uungor: "Uungor, he say no crazy. But he is. He say he going. Away. Far. Your friend sleep there when Uungor goes. But Fimmion no think Uungor really leave. You make Uungor go away faster. He won't leave without his lucky grapes. Can't eat them. I tried. Give back to him. If he still no go, make Uungor crispy with fire spell. Then glaze. Then eat him like a giant sweetroll. Saa-WEET-ROOOOOLL!" When you present Uungor with the grapes, his disposition will rise accordingly and he will say: I've been looking for those. I thought Fimmion stole them thinking he could eat them, but I could never prove it. Thank you for returning them." He will then agree to switch beds with Fanriene: "Well, it sounds fishy, but I suppose I can trust you. I'm sure I'll regret this later, but... yeah. Sure. Fine. I'm tired of sleeping outside. Tell him I'll sleep in his bed and he can sleep in mine." After the related quest, Uungor will move into Amiable Fanriene's house and take up a slightly new schedule. He will now sleep and eat inside his new property, as well as relax there for four hours before bed. Otherwise his daily life remains unchanged. Falling Awake: Find a place to sleep for a scared Breton.